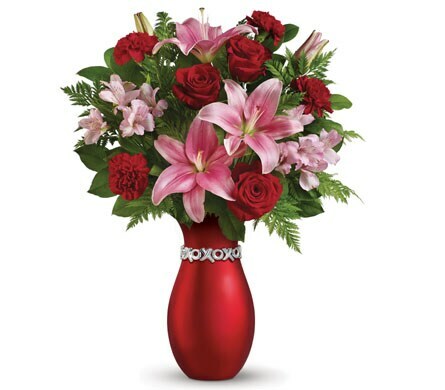 Rich red roses, pretty pink lilies and delicate alstroemeria are masterfully arranged in a stunning XOXO Keepsake vase they'll treasure forever. The XOXO Keepsake Vase is only available for delivery in Australia and New Zealand. Packaging, container and filler foliage may vary from picture. If the requested keepsake container is not available, you will be contacted and offered a second choice.